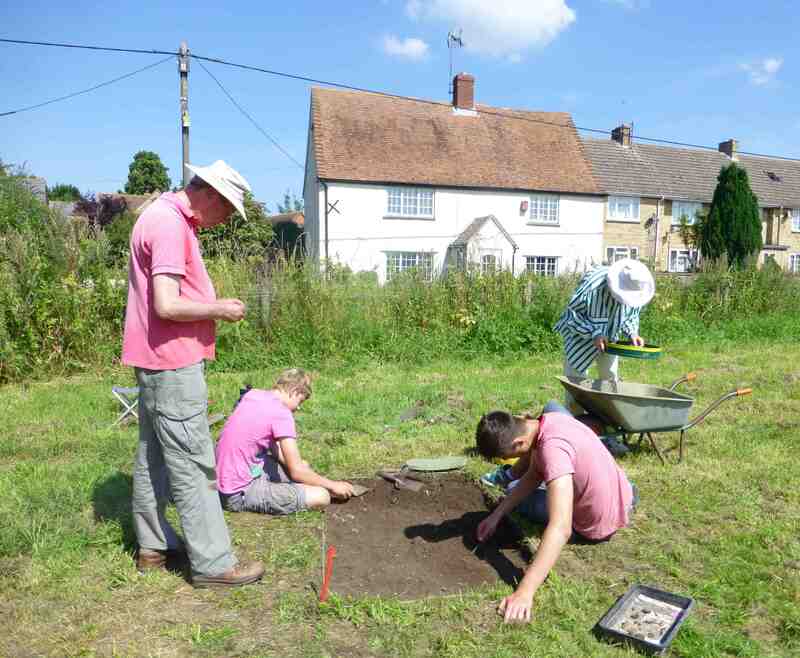 Over three days in August 2012, residents from Marcham and the surrounding villages took part in archaeological investigations at Farm Close, Manor Farm. Farm Close, as the name suggests, is a small paddock next the farmhouse and lies in the heart of Marcham village and less than 1 km to the northeast of the substantial Iron Age, Roman and Romano-British complex on Trendles Field. 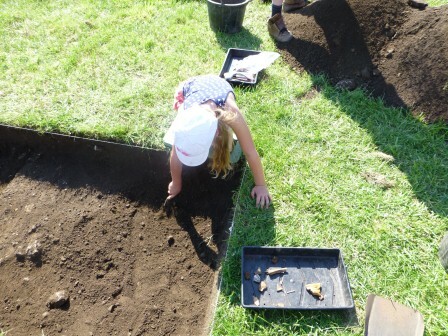 The dig was open to anyone with an interest in archaeology, with training provided by archaeologists who had worked on the Trendles Field excavations, and almost 40 adults and children took part. In addition to excavation, other activities, including finds and environmental processing and talks on artefacts and local history went on over the three days. The aim of the event was two-fold. The first was to provide an introduction into archaeological practice and to show that archaeology has responsibilities. Archaeology is a destructive process, effectively destroying deposits and structures that have remained untouched for hundreds and sometimes thousands of years. It is the duty of the archaeologist to keep photographic, descriptive and drawn records of all the features and deposits they dig, and to carefully record where any finds came from, so that activities in the past can be reconstructed in the present through post excavation analysis (as we are now doing in the Trendles Project). 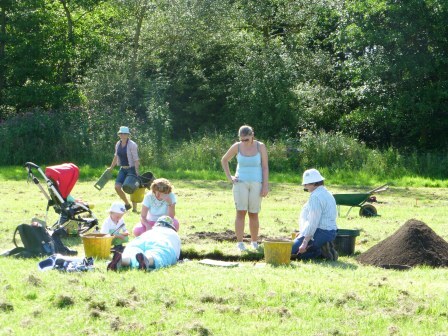 The second aim was to see if the Roman and Iron Age activity investigated at Trendles Field extended into modern-day Marcham. 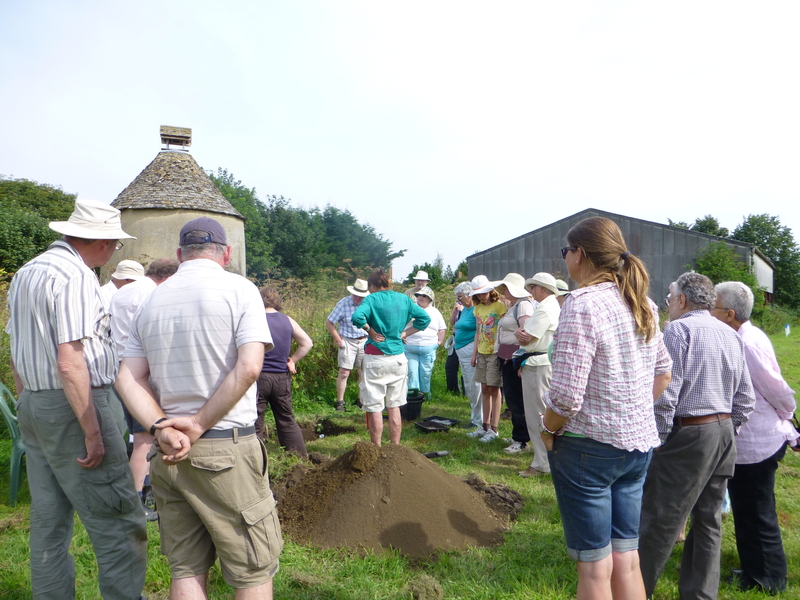 It was also an opportunity to find out more about Farm Close, and how it might have been used in earlier periods. Before the excavations took place, a geophysical survey was carried out by William Wintle and Trendles Project volunteer John Hawes which revealed a possible section of large curving ditch in the northeast corner of the field. There was also a suggestion on John Rocque’s map of 1761 that cottages or other buildings might once have lined the road in the north of the field. The small auger survey across the site showed that the geology was variable with shallow calcareous soils over limestone in the east grading to deeper waterlogged deposits in the west. A small area with a much deeper deposit was discovered in the north of the field, close to the location of the possible buildings shown on the historic mapping. Small test pits were an ideal size to teach the process of archaeology and these various features were investigated through nine test pits. A small number of very abraded pottery sherds, a fragment of glass and a square-cut nail recovered from test pits in the south of the field provided the only evidence for Roman activity, and much of the later activity was focused in the north of the site towards the line of the road (the modern A415). Test Pit 5 in the north confirmed the ditch identified through magnetometry. This was 30cm deep and 80cm wide although probably truncated through later ploughing and its purpose is uncertain. The lower fill contained large amounts of 13-14th century pottery, mostly Brill/Boarstall ware, a small number of finds of a domestic nature, and the fragmentary remains of sheep, cattle and pig. 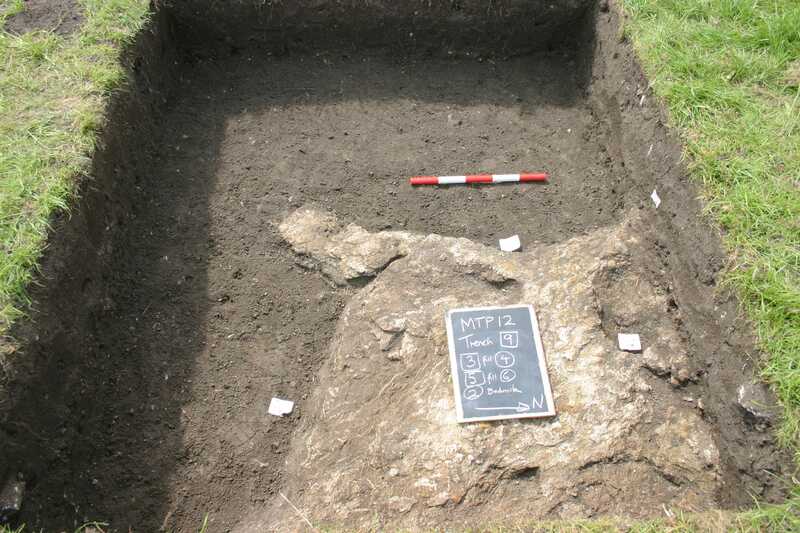 Some evidence for a structure in the form of postholes and a possible mortared floor were recorded in Test Pit 7 in the area identified from historic mapping. A few metres to the south of this a number of intercutting pits were discovered in Test Pit 9. These were recorded in plan, but owing to time constraints were not excavated. A mixture of 13th-14th century pottery wares recovered from the surface of the features, suggests the underlying features are contemporary or earlier. By the end of the three days, everything was carefully recorded and everyone had a story to tell – the condition and sparsity of the Roman finds was in complete contrast to those recovered from Trendles Field and were possibly deposited during manuring with domestic waste, suggesting we are on the edge of Roman arable fields. Much of the evidence recovered was for medieval domestic activity or settlement, hinting at an earlier forgotten fragment of the village. Thanks as always are owed to the Cumber family for their interest and support, without which the event would not have been possible, and to everyone who gave up their time to help discover a further piece of Marcham’s history.